When we first bought our property on the shores of Little Kennebec Bay in Downeast Maine, a friend gave me a copy of The Country of the Pointed Firs by Sarah Orne Jewett. I loved the book and loved the images that came to mind from the title even more. I knew I had to create something to reflect that title. Here's where my explorations have taken me so far. 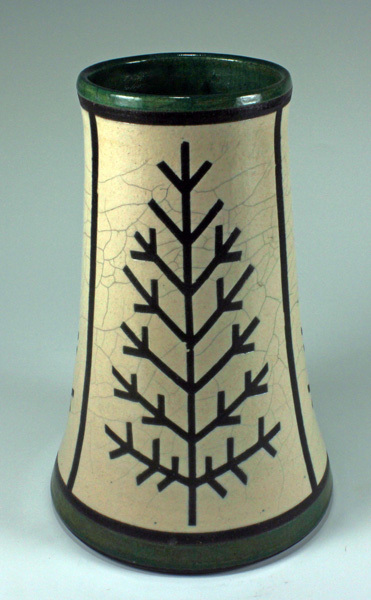 The Pointed Firs, large and small, flow all the way around the vase on a white crackle background. 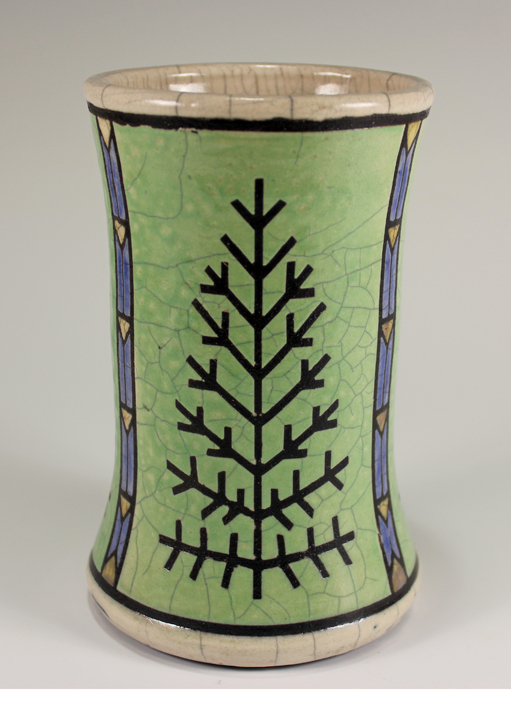 The inside of the vase is a dark green, reflecting the color of the trees in the forest. Three panels of Pointed Firs are separated by classic Arts & Crafts stripes. 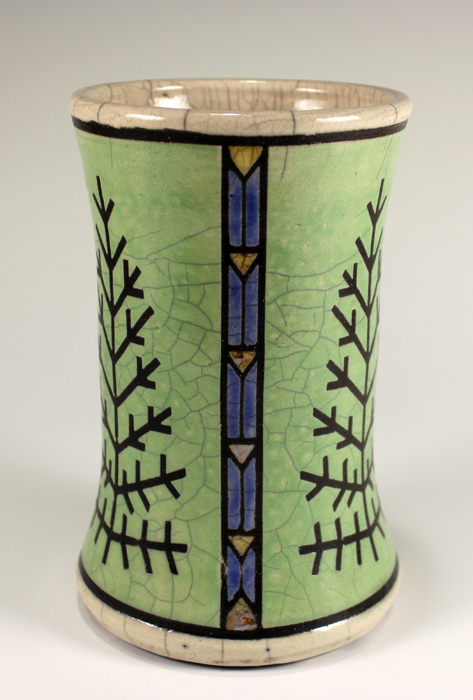 The celadon crackle glaze background and blue stripes reflect the feelings of forest and sky. 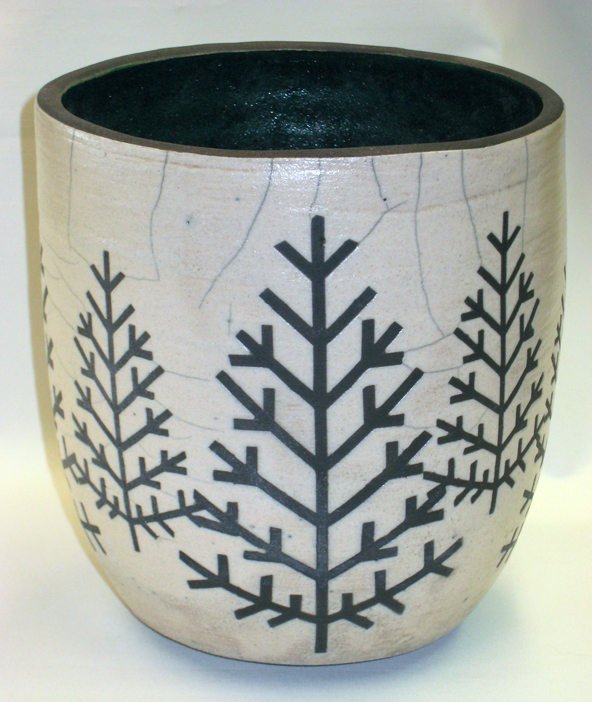 Three Panels of Pointed Firs are bordered top and bottom with a rich forest green glaze complementing the white crackle background glaze. A tile tabletop is in process using the Pointed Firs designs. Look for pictures of it early in the new year. I'm looking forward to further explorations with this design on other shapes, introducing other colors, using it on tiles and making a tile tabletop forest of pointed firs.